The Football League Cup, commonly known as the League Cup or by the name referring to the title sponsor (currently the Capital One Cup), is a football competition played by teams in England and Wales. Similar to the FA Cup, it is played on a knockout (single elimination) basis. Unlike the FA Cup, where 758 teams entered in 2012–13, only 92 clubs can enter the League Cup – the 20 Premier League clubs, and the 72 clubs of The Football League, which organises the competition. Also unlike the FA Cup, the semi-finals are played over two legs. The winners qualify for the UEFA Europa League, unless they have qualified for the Champions League through their league position, in which case the Europa League berth goes to the highest-placed team from the Premier League not already qualified for Europe. The current holders are Chelsea, who beat Tottenham Hotspur 2–0 in the 2015 final to win their fifth League Cup. Although the League Cup is one of the three major domestic trophies attainable by English league teams, it is perceived by larger clubs as a lower priority than the league championship, UEFA Champions League, and the FA Cup. League Cup winners receive £100,000 prize money (awarded by the Football League) with the runners-up receiving £50,000, considered relatively insignificant to top-flight teams, compared to the £2 million prize money of the FA Cup, which is in turn eclipsed by the Premier League's television money (awarded on final league position) and consequent participation in the Champions League. Some clubs have made a point of fielding a weaker side in the competition, making the opportunity for giant-killing of the larger clubs more likely. Many of the top English sides, Arsenal and Manchester United in particular, have used the competition to give young players valuable big-game experience. In 2010, in response to Arsène Wenger's claim that a League Cup win would not end his trophy drought, Alex Ferguson described the trophy as "a pot worth winning". The women's game has its own League Cup, which is open to the 36 women's clubs in the three divisions of the FA Women's Premier League, although the women's competition is governed by the FA and not the Football League. The original idea for a League Cup was that of Stanley Rous who saw the competition as a consolation for clubs who had already been knocked out of the FA Cup. However it was not Rous who came to implement it, but Alan Hardaker. Hardaker, the Secretary of the Football League initially proposed the competition as a way for the clubs to make up on lost revenue due to a reduction in matches played for when the league was to be re-organised. The re-organisation of the league was not immediately forthcoming, however the cup competition was introduced regardless. The League Cup was criticised by the better endowed clubs, The Times' correspondent at the time felt that the League Cup was a step in the wrong direction, the European Cup had been formed in five years prior to the League Cup and the correspondent felt the League Cup's introduction was adding to existing problems. The Times published on May 30, 1960: "Where a drastic reduction is required in an attempt to raise quality, no doubt quantity and a further spread of mediocrity will be the dose. Where men like Count Bernabeu with his wider horizons, think in terms of a European-league for the future in which a lead could surely now be given jointly by our leaders, the Football League propose next season to implement their useless Football League Cup to be played in midweek. It gets the players, the clubs and the public nowhere." Aston Villa were the inaugural winners in 1960–61 defeating Rotherham United 3–2 in the final over two legs. Football in England was considered to be of a low quality compared to what was being played on the continent, as relatively unfashionable clubs Burnley and Wolverhampton Wanderers were England's representatives in Europe that year, having lifted the major honours ahead of much bigger clubs like Arsenal and Manchester United. Richards referred to the appetite for European football as 'continental fever' and was keen for the league to re-establish itself . 'We must be prepared to put the interests of the League and the game before individual clubs.' Sixteen clubs opposed the competition's creation, thirty one approved it. The average attendance across the League Cup was 10,556, just higher than the average gate in the Third Division. The total attendance of the Football League competition had fallen by 4 million from the previous season. Richards is reputed to have told Hardaker that he foresaw the League Cup final being held at Wembley, but that it wouldn't be during his lifetime. The first League Cup final to be held at Wembley was Third Division Queens Park Rangers' win over First Division West Bromwich Albion on 4 March 1967. Richards died in 1968. The first League Cup was won in 1961 by Aston Villa, who still held the overall record for major trophies won despite their last piece of silverware being won during the interwar years. The next three finals, however, saw the trophy won by clubs who had never won a major trophy before. One of them, Norwich City, had yet to even play in the First Division, while their opponents Rochdale hadn't even played in the Second Division. Prior to the agreement with UEFA, the competition wasn't considered worthy of the larger clubs attention. However once a position in Europe was on offer, as was a final at Wembley Stadium, the competition's standing was improved and in the 1968–69 season only Manchester United declined to participate. Everton chose not to compete in 1970–71 so that they could concentrate their efforts on the European Cup. Entry was made compulsory for all Football League teams the following year. In October 2013, UEFA announced that from the 2015–16 season, finishing runner-up would no longer qualify teams for European Competitions should the winner otherwise qualify and instead the places in Europe would be awarded based on league position. Giant killings are less well remembered in the League Cup than the FA Cup due to the absence of non-league sides and the fact that many big clubs have fielded very under-strength sides when knocked out. However, there have been some notable upsets, such as Fourth Division side Chester knocking league champions Leeds United out 3–0 en route to the semi-finals in 1974–75. In 1995–96, Manchester United were beaten 3–0 at home by York City in the second round, first leg; United could only win 3–1 in the second leg and went out 4–3 on aggregate (York went on to repeat the achievement against Everton the following year). Also,the final of 1967 saw Division Three side Queens Park Rangers come from 2–0 down at half time to win 3–2 against top-flight West Bromwich Albion in the first League Cup Final to be hosted at Wembley Stadium. Two years later in 1969, Third Division side Swindon Town beat Arsenal 3-1 after extra time in the final to win the trophy. In 2001–02, holders Liverpool were defeated 2–1 at home by Grimsby Town, then humbled again by Northampton Town in September 2010. Grimsby recorded another giant killing in 2005 by knocking out Tottenham Hotspur. In the 2012–13 competition, League Two side (fourth tier) Bradford City knocked out Premier League sides Wigan and Arsenal en route to a semi-final disposal of another top tier side Aston Villa 4–3 on aggregate to reach the final, becoming the lowest-ranked team to do so since Rochdale in 1962. Swansea City, in their centenary year, became the first team from outside England to win the League Cup on 24 February 2013, when they beat Bradford City 5–0 to win their first major cup. Former League club and now defunct Scarborough defeated Chelsea 4–3 on aggregate, in October 1989, while a Division 4 club. In 1992–93, Scarborough then defeated Coventry City (then a top-tier side) 3–2 on aggregate, before ultimately going out of the competition, narrowly 1–0, against Arsenal. The League Cup is open to all 92 members of the Premier League and the Football League and is divided into seven rounds, organised so that 32 teams remain by the third round (with the exception of the 1961–62 competition). Since 1996–97, teams involved in European competition during the season have received a bye to the third round; the remaining Premier League teams enter at the second round, and the remaining Football League teams enter at the first round. If the number of byes causes an odd number of teams to enter a round, another team may be given a bye (usually the highest-placed team of those relegated from the Premier League the previous season) or a preliminary round may be played between the two teams promoted from the Football Conference the previous season (or, if only one team is promoted, that team would play against the lowest-placed team not to be relegated from the Football League the previous season); preliminary rounds have only been necessary in the 2002–03 and 2011–12 competitions. Up to 1995–96, all teams were involved by the second round, although some received byes to that stage. For the first six seasons of the Football League Cup, the final was played over two legs, with each leg being played at the home ground of each finalist. Since 1967, the final has been played as a single match at Wembley Stadium, although the Millennium Stadium in Cardiff was used between 2001 and 2007, following the demolition of the old Wembley. Between 1967 and 1997, finals that finished level after extra time would be replayed at an alternative venue until a winner was decided. 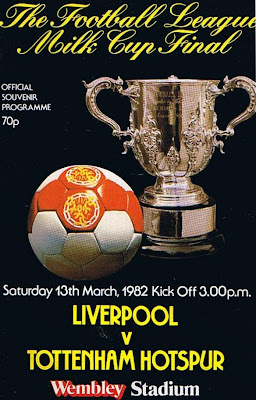 The only final to require two replays was the 1977 final between Aston Villa and Everton. The venues that hosted replays were Hillsborough Stadium in Sheffield, Old Trafford and Maine Road in Manchester and Villa Park in Birmingham. Since 1998, finals that have finished level after extra time have been decided by penalty shoot-out. Until 2000, the final was played in later March or early April. Thereafter it has been played in later February. Since 1990, the best player in the League Cup final – as chosen by the Sky Sports television panel – has been presented with the Alan Hardaker trophy, named after the former secretary of The Football League who devised the Football League Cup. The current holder of the trophy is Chelsea's John Terry; Terry and Ben Foster are the only players to win the award more than once. From the 2009–10 season to the 2011–12 season, Sky Sports broadcast selected Round 1 to quarter final matches. The BBC broadcast Tuesday semi final first legs and second legs while Sky Sports broadcast Wednesday semi final first legs and second legs. The final was co-broadcast by the BBC and Sky Sports. From the 2012–13 season, up until at least the 2017–18 season, Sky Sports have a contract to broadcast 15 live matches per-season, including semi-finals and final. The trophy presented from the first season of the Milk Marketing Board sponsoring the competition, 1981–82 to 1985–86. This page was last modified on 3 December 2015, at 09:04.